Dr Katharine Vincent is in Zambia supporting district teams in mainstreaming climate resilience into Integrated Development Plans. 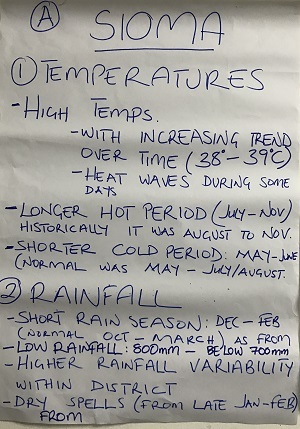 As part of the Pilot Program for Climate Resilience, seven districts in Western Province, together with national and provincial planning staff from the Ministries of Local Government and National Development Planning, have been trained on the process of mainstreaming climate resilience into the planning process. Technical support has also been provided to Mongu, Limulunga, Sesheke, Mwandi, Mulobezi, Senanga and Sioma districts in mainstreaming climate resilience into their Integrated Development Plans. This follows on from earlier workshops to mainstream climate resilience into District and Ward Development Plans, and training on the process of Gender-sensitive Climate Risk Assessment.